– Fifty years ago Monday (Feb. 20), John Glenn, the first American to orbit the Earth, relied on ground stations located across the planet to communicate with his control team. But after his Mercury spacecraft, Friendship 7, safely splashed down, it was another type of station that took over tracking his historic mission: U.S. post offices. For the first and only time in the country's postal history, the United States Post Office Department — since 1971, the U.S. Postal Service — surprised the public with the release of a secret stamp celebrating Glenn's successful mission. 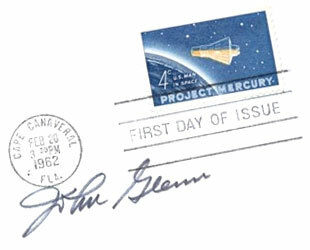 The 4-cent "Project Mercury" postage stamp was revealed and immediately put on sale in 305 post offices within an hour of Glenn's triumphant return to Earth at 2:43 p.m. EST (1943 GMT) on Feb. 20, 1962. Half a century later, collectors are still searching for those first-day-of-issue stamps. "The U.S. Post Office Department signaled the first orbital flight of a United States astronaut today with the issuance of a commemorative stamp, placed on sale throughout the country on the exact hour Astronaut John Glenn's historic flight was officially completed," the department stated. "It is the first time in history that a previously unannounced commemorative stamp was issued simultaneously with the event it memorializes." As news of the stamp spread over radio and television, the public began lining up at their closest post offices that had stock of the now no longer secret issue. Collectors in particular drove many miles to have their blank envelopes postmarked with the surprise stamp, creating a collectible for that first day's release and the historic space flight it honored. Without a way to coordinate nationwide, collectors couldn't know however if such "first day covers" existed for all 305 stations. To this day, 50 years later, as many as 20 cities are still missing examples. The Post Office Department wanted to keep the stamp a secret in case the mission failed. Keeping the production and distribution of more than one million postage stamps a surprise though, required some creative logistics. "Designed and printed under tight security precautions at the Bureau of Engraving and printing, the stamp was distributed well in advance of the flight to more than 300 large postal installations, where it was held intact until the flight was completed," the department stated. "None of the postmasters knew what the closely guarded packages contained until the word was given from Washington [to remove the wrappers and place them on sale]." 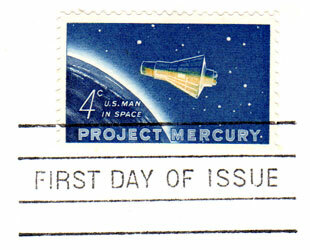 Knowledge of the Project Mercury stamp project was kept on a need-to-know basis. Just over 400 people knew the secret, about half of them postal inspectors. The stamp's designer, Charles Chickering, worked from home to create the blue and yellow depiction of Friendship 7 circling the Earth while all along claiming to be on vacation. The picture engraver also gave the impression he was on leave, but came in at night. Another engraver who did the lettering worked on weekends. "At the Bureau of Engraving and Printing, a rumor was spread that a new multicolor Giori press was locked away for printing test runs of multicolored money," the USPS later recounted in a 2005 release. "In fact, the new press was being used to print the Project Mercury stamp." Once the stamps were ready to ship, they were loaded in mailbags with combination locks and marked "Classified Material" and "Do Not Open." They were delivered to the selected postal stations, but addressed to the attention of the postal inspector so curious postmasters wouldn't take an early peek. Even with all the precautions, the department's secret was almost blown. 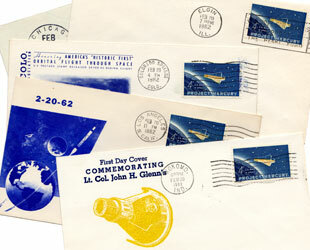 According to the American First Day Cover Society's (AFDCS) "First Days" magazine, a newspaper in Florida reported a rumor of a secret stamp in the run up to Glenn's original launch date in December 1961. The Post Office Department was able to successfully dismiss the report and by the time Friendship 7 actually launched, two months later on the mission's 11th scheduled date, the stamp's release came as a true surprise. The site of the official first-day-of-issue cancellation was Cape Canaveral, Fla., Glenn's launch site, where the Post Office Department established a temporary station. But given the stamp was a surprise and limited to just 305 post offices, it wasn't long before collectors began trying to assemble nationwide sets. Further limiting the potential for first day covers was the time of day when the stamps were released. The call from Washington to open the mailbags came at 3:30 p.m. EST. For post offices on the East Coast, such as Boston, New York City, and Baltimore, that meant that customers had only a few hours before the offices closed to obtain first day postmarks. The most time was afforded at the station farthest west, Honolulu, Hawaii, where the stamps were released at 10:30 a.m.
By the following year, one enthusiastic collector, Patricia Grace Siefert, had compiled a guide. The typewritten "An Unauthenticated Classification of the First Day Covers of the Project Mercury Stamp" documented postmarks from 248 of the official cities, as well as others including U.S. Navy ship-board cancels and "unofficial cities." In the case of the latter, collectors had purchased stamps from one of the 305 post offices identified by the Post Office Department and then drove to other post offices to have them canceled. By July 1963, Seifert had cataloged 90 of these "unofficial" cities. Seifert warned however, about the chances for fraudulent covers, particularly when it came to envelopes canceled in unofficial cities. "Especially should we be cautious of covers from cities whose location is at such a distance from one of the official cities that it would have been impossible for the stamp to have been canceled there," Seifert wrote. 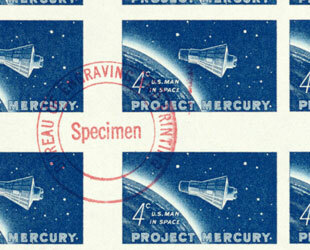 The 4-cent "Project Mercury" stamp and its use on covers turned out to be very popular. By the time the stamp was withdrawn from sale on June 6, 1962, more than three million of the 310 million stamps ultimately produced had been postmarked on collectors' envelopes. By the end of the first day, some 10,290,850 of the stamps had been sold. But the distribution of those millions of covers was not evenly spread across the country. At least 250,000, if not upwards of a million of the stamps were canceled at the Post Office Department's official Cape Canaveral station. For the other 305 official cities, the number of covers were much smaller. In a few cities in fact, no covers may have been issued at all. On Feb. 20, 1962, a snowstorm blanketed parts of Ohio, preventing stations in the towns of Mansfield and Marion from selling the stamps. Meanwhile in Warren, Pa., the mailbags were not opened until after the office's customer windows had closed. Fifty years later, 17 other cities' covers are still missing, not all of them from small towns. Covers have yet to be found for Fort Lauderdale and Tallahassee, Fla., Atlantic City, NJ and Durham, NC, for example. One the "thousands" of autographs John Glenn has signed over the past 50 years on "Project Mercury" stamp first day covers. Collectors like Seirfert and Monte Eiserman, who wrote of his experiences in AFDCS's "First Days," pursued finding as many cities' covers as they could. And though interest in the covers has dwindled over the past five decades, there are still those on the hunt. One such collector, Henry Scheuer of New York City, was profiled by the New York Times for his lead in the search in 1990. Twenty years later, he reported finding a first day of issue postmarked envelope for Little Rock, Ark., one of the cities long thought lost. And what of the subject of the stamps themselves? For his part, John Glenn says he does not remember how he first learned of the stamps or where he first saw them. But he is very familiar with them now. "I have certainly seen enough of them since then," Glenn told collectSPACE. "They had first day covers that were put out that day too, and the autograph collectors collect them. I've signed thousands of those things." Underlined cities indicate where no "first day covers" have been found.